A law practice representing victims of wrongful conduct. Barney Law PLLC provides aggressive representation for clients in the areas of wrongful death, serious personal injury and employment-related matters. Attorney Mark Barney strives to know his clients as individuals, not by case name or number. Barney Law PLLC fights for the rights of clients each and every day, until the job is complete. Achieving the best results for clients and holding others responsible for their wrongful conduct are at the forefront of any representation. Mark Barney has a solid record of representing people against coal companies, construction companies, insurance companies, the state of West Virginia and other entities that have wrongfully caused injuries. Whether you are looking for an experienced attorney to take on a large corporation or just want information, you are invited to contact us at any time. There is absolutely no charge or obligation for the consultation. 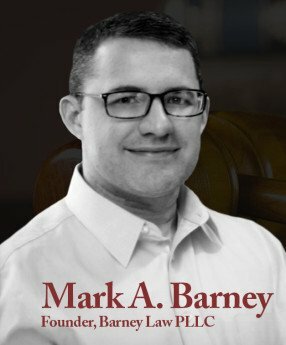 An advocate for the underdog, Mark Barney is the founder of Barney Law PLLC. His basic approach to handling a client’s case is simple: work hard; do what’s right; and never back down. As a native West Virginian, Mark understands hard work. Whether in the office or in the field, he tackles every issue that arises with vigor. Mark received his B.A. from West Virginia University double majoring in Psychology and Sociology. Thereafter, he received a Master of Arts in Sociology from West Virginia University where he was named the Outstanding Graduate Teaching Assistant for the Department of Sociology & Anthropology. Upon completion of his M.A., Mark attended the West Virginia University College of Law. While in law school, Mark was the recipient of the WVU College of Law Gladys G. Davis Law Scholarship and worked for the General Counsel of West Virginia University. Mark served as a research assistant for law professor Judith Scully and was part of WVU’s national mock trial competition team. He was also a participant in the West Virginia Governor’s Honor Program. After law school, Mark chose to serve the citizens of West Virginia. He worked as a judicial law clerk for the Honorable O.C. Spaulding in the Twenty-Ninth Judicial Circuit of West Virginia. Thereafter, he accepted a position as an Administrative Law Judge for the West Virginia Public Employees Grievance Board where he issued over fifty (50) written decisions addressing issues of West Virginia public employee law. Prior to founding Barney Law PLLC, Mark worked for a mid-size personal injury law firm representing injured workers, and their families, who were the victims of unsafe conditions in the workplace. He is recognized by his peers as an “AV Rated- Preeminent Lawyer” and is honored to be selected by The National Trial Lawyers to the list of Top 100 personal injury attorneys. He is admitted to practice before the West Virginia Supreme Court of Appeals, the Fourth Circuit Court of Appeals, the U.S. District Court for the Southern District of West Virginia and the U.S. District Court for the Northern District of West Virginia. Mark lives in Putnam County with his wife, daughter and dog named Twila. When not with his family or in the office, Mark can be found hunting or fishing. Hurricane, Teays Valley, Winfield, Huntington, Milton, Point Pleasant, Hamlin, Charleston, St. Albans, Nitro, Elkview, Madison, Logan, Chapmanville, Mann, Beckley, Sophia, Summersville, Fayetteville, Oak Hill, Oceana, Pineville, Welch, Princeton and surrounding areas throughout West Virginia.